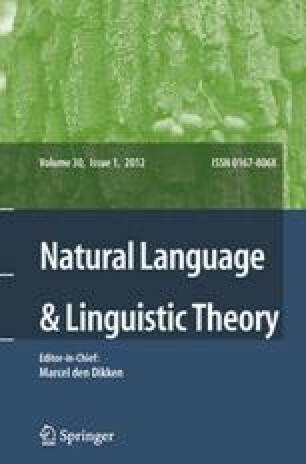 This paper focuses on the question which phi-features are associated with pronouns and how these features are distributed over their internal structure. I argue that pronouns contain Participant and Individuation features (Harley and Ritter 2002). The Participant features and the Individuation features are merged as discrete sets of features which can be targeted for syntactic operations like Agree independently from the other phi-features associated with pronouns. These feature sets are merged and end up on the maximal projection of the pronoun as one feature bundle. The core data of this paper are constituted by Complementizer Agreement (CA) in Dutch dialects (cf. Haegeman 1992; Zwart 1993). In (the mostly West-Germanic) dialects with CA, the subject of an embedded clause agrees with both the finite verb, and with the complementizer introducing the embedded clause. I show that there are two types of CA dialects. In the first type, the complementizer and the finite verb have the same ending. In the second type, the so-called Double Agreement (DA) dialects, however, the complementizer and the finite verb do not have the same affix. What has gone unnoticed in the literature until now is that these two types of CA dialects can be distinguished on the basis of two more properties: CA in the DA dialects is sensitive to (i) extraction of the embedded subject pronoun to a higher clause and (ii) modification of the subject pronoun by a focus particle. I argue that the differences between these two types of CA can be explained if C does not target the same Goal in these dialects. In the DA dialects CA is the result of a Probe agreeing with the Participant features inside the pronominal structure, whereas CA in the other dialects reflects agreement with the top node of this pronominal structure. Haegeman, Liliane, and Marjo van Koppen. 2011. Complementizer agreement and the relation between T∘ and C∘. http://ling.auf.net/lingBuzz/001181.